I am about to make a few Scabbards, and wanted to get some more data and a broader base for my recreation first. I have a few 15th C. longsswords and one handed swords, that need scabbards. Also a late 16th C. cavalry sword and some 18th C. Smallswords. While the 18th C. source talks about glueing in a thin fine woolen fabric on the inside, IF the customer wants the scabbard to be lined. And as I have heard from friends and Tod, that early (like viking etc.) scababrds were lined with felt, fur even, some other friends told me 15th C. scabbards were not. This sounds a bit odd. Also, how do metal fittings for belt attachments etc fix to scabbards, are they glued on, or just held in place by friction? 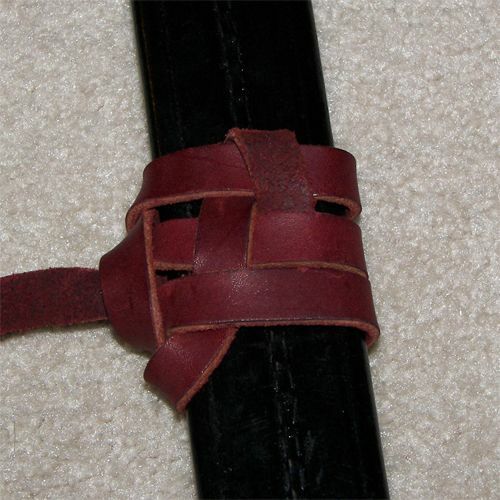 Tying in with the previous question, it seems the straps holding the scabbard were most commonly knotted to the scabbard. Just how this know would be made, I'd need to find out. Maybe someone here can help? 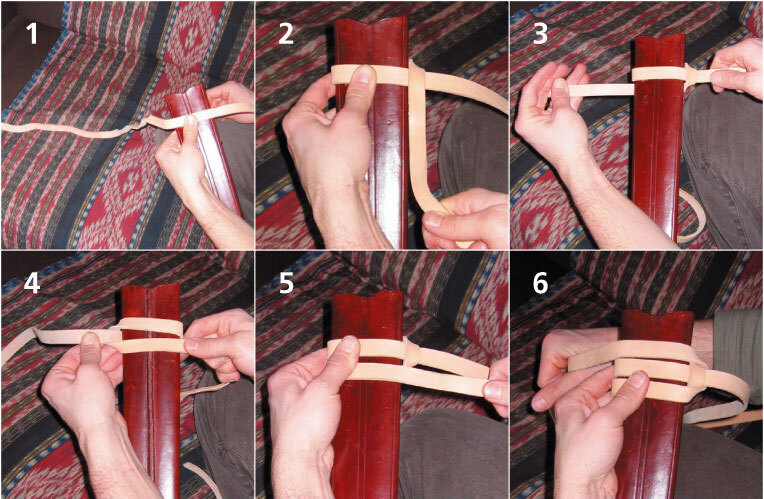 Last but not least: For my longsword(s) I very much like the style of two straps from the belt going to the scabbard, and the excess length of the belt coming from the buckle passing through another buckle near the scabbards throat. Are harnesses for single handed swords any diffrent from long sword ones? In every case, any period specimen pictures showing any detail or technique would be greatly apreciated, to form a database for reference for my future projects. Actually, scabbards changed quite a bit through the centuries in terms of construction, materials, lining, decoration, and , most of all, suspension. And as I have heard from friends and Tod, that early (like viking etc.) scabbards were lined with felt, fur even, some other friends told me 15th C. scabbards were not. This sounds a bit odd. This is true as far as I can tell from my research. Are harnesses for single handed swords any different from long sword ones? Depends on the time period, but in general, the harnesses were similar. Browse through the illuminated manuscripts and period paintings to see the various harnesses. Use 1.5mm string for the risers. Then gently wet form the leather around the risers. I use contact cement. This process does affect the leather and dye uptake so I dye the leather first. That is why I was wonderign and still am, about late medieval scabbards not being lined with some sort of fabric. It clearly seems that was done before and after. Why was it not done then? Or was it, like in the 18th C., optional, and not very often done anymore? My swords are all 15th C., so my main concern is how to strap tose on. Can you hint me at a decent source for period imagery? * It seems thin strips of beech, lined with wool fabric or felt that is glued together with hide glue and black leather sewn over it for a medieval scabbard works as authentic option, whereas thin strips of beech, lined with wool fabric or felt that is glued together with hide glue and black leather sewn over it also works for 1770s smallsword. The main difference of the scabbard construction istelf seems to be the use of thinner wood for the latter, in keping with the lighter sword and blade. 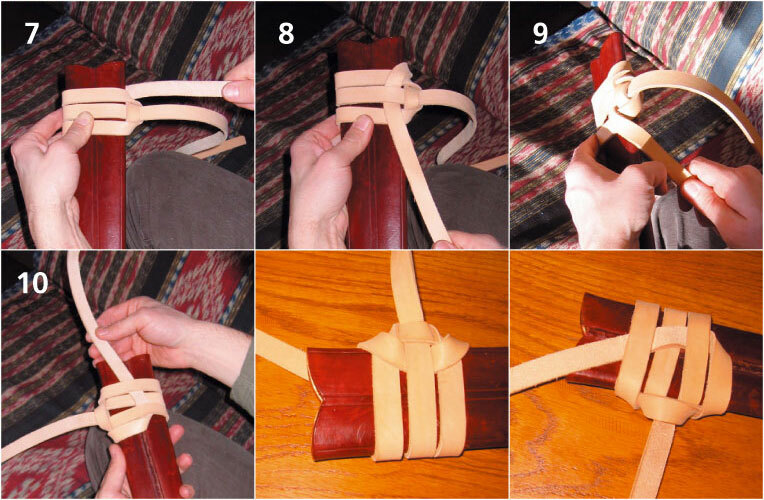 Picture 1 and 2 show the front knot, which is also the attachment of the front buckle, pic 3 shows how to tuck the strap if not used for said buckle.